I finally felt good enough to get into my craft room and play with my stuff! My knee is still very stiff and sore. I am following all the rules and doing my physical therapy. So now I just need to learn patience!!!!! I only had energy for something small, so I thought I would make a tag. Unfortunately...my lavender looks more like Fushia!!! It was so good playing with my Gelatos and stencils...getting my fingers all dirty! I was exhausted!!!! I had to go take a nap!!! Hopefully, I will be able to play again soon! I am glad to hear you had some energy to make a tag, Mackie. I know ALL about feeling good then all of a sudden you hit that wall and youre pooped. I can vouch for you that the amount of crafting time will lengthen. I just hit my three month mark since the lapidus bunionectomy, and i am finally starting to walk with a shoe again. Amen. Good luck to you with your healing and PT (those PTs are angels arent they?). Good to hear you are following what they tell you to do! Take care and nap often. I'm happy to hear you're doing well Mackie. Your strength will return, just take it easy. I've been through it too and it seems the older I get the longer it takes to bounce back...it's heck getting old LOL!!! Your tag is a little masterpiece, love the hearts!! I'm so Honored you chose to play with US! LOVE your PRETTY tag! FAB sentiment and LOVE the hearts! 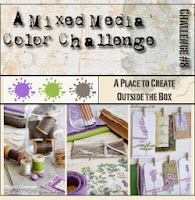 THX for playing with us at A Mixed Media Color Challenge! Happy to hear that you were able to get to craft table and make a lovely tag! Love the colorful background, heart, trim, and beautiful bow! Good luck with your recovery...take care! Happy to hear you are on the road to recovery Mackie! I'm proud of you for following your Dr's orders ~ some pt's don't and end up in surgery to have the adhesions broken up! OUCH! The PT is so incredibly important! Your tag is gorgeous! love the whimsical hearts! 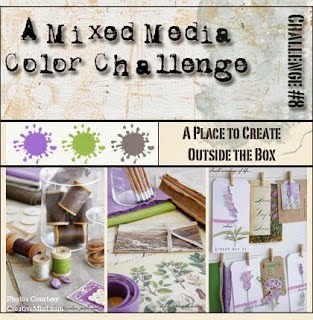 Thank you so much for sharing your creativity with A Mixed Media Color Challenge! So glad you're feeling better! This may be a small tag but it's full of amazing color and texture. The background colors are mesmerizing. Love it! Ahhh.....feeling a little better....that's good!! Maybe just a tag but, it's a gorgeous one!! Keep doing what you're doing (PT and all) and eventually there will be light at the end of the tunnel!! What a beautifully coloured and designed tag. Great background and hearts and I like the little button. This is so bright and cheerful! love the colors on your background! Hi Mackie, your tag is adorable!